While you may be able to cut many things out of your budget, grocery shopping is not one of them. However, you can still find ways to save money if you plan properly. 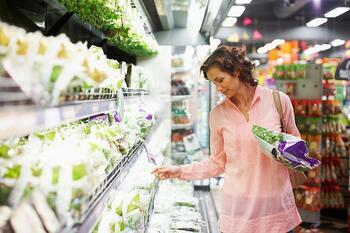 Check out some ideas below to help you start grocery shopping smarter. Take a detailed stock of your pantry and freezer so you don’t buy doubles of what you already have. Whenever you run out of something, make a note in your phone so you know exactly what you need during your next shopping trip. When selecting between items, you not only need to look at the sticker price, but the unit price as well. This is the price of an item per unit, such as ounces. You can find this on the item’s shelf sticker. For example, if you are comparing two bottles of orange juice, look at what the bottle costs per ounce. If you can get a bottle that's 10 oz. bigger for about the same unit price as the smaller bottle, that's a great deal. Plan ahead so that you only need to go shopping every other week. This will not only help prevent impulse purchases, but you’ll also save on gas and time. Make detailed shopping lists and only visit the areas of the store in which these items are located. Eliminating aimless wandering through the store will help cut down on impulse purchases. It will also help you remember everything you need so you don’t needs to make multiple trips to pick up that ingredient you forgot. Products in your line of vision as you walk down the aisles are usually priced more. This is done in the hope that you will grab the first thing you see. Check the top and the bottom of shelves where better deals may be in hiding. Plan your trips when you have just enough time to do so. A leisurely shopping trip can lead to unnecessary strolling and buying things you don’t need. By giving yourself a limited amount of time, you can quickly grab what you need and then head home.